CDI has also worked as a consultant for Thai family businesses in the past. Experience tells me that as these family businesses grow, some would choose to go public, and those that do so have a need to evolve from a “family business” to a “company”. What do you think about the future challenges for family businesses in Thailand and other Asian countries? The lack of a proper structure for information management is certainly a big issue. I am also consulting for a Thai company, and I have found the in-house information management to be very lacking. There are cases where, despite the cashflow appearing to be healthy the company doesn’t know if they are profitable in a fiscal year. The unwillingness to pay for intangible services and software is also conducive to their weakness in information management. Family businesses in Asia have grown in a period of rapid economic development, and as such, the founding members did not have the time to obtain knowledge in management or establish the structure of their organization; a major difference compared to Japanese family businesses. You’ve touched on the subject of organizational structure; can you expand on that? also a case of company shares being split equally between the children instead. Thus, it can lead to situations where a consensus cannot be made between major shareholders, or where a company group ends up being divided. Take Hyundai Group in South Korea, for example. While there are a variety of businesses under the name of Hyundai, many are independently operated. In such a case, the risk of a takeover would increase, by taking advantage of the disunity between the family members. In Japan on the other hand, even in the cases of companies’ ownership being succeeded by the family’s next generation, they tend to only choose one successor. One way this problem could be resolved is through the use of a holding company, and create a family charter between the shareholding family members. In order to compromise between the rules as a family and the rules as a company, a holding company should be considered. Succession in family businesses is a big issue in Japan as well. As the company founder grows older, the period in which a successor from the next generation should be appointed comes closer. First, when thinking about family businesses, I use the phrase “family controlled firm” to distinguish the companies that are owned by the family and those that are controlled by the family. For example, in the case of Toyota Motor Corporation, the founding family only owns a few percent of the company shares. However, the influence and control the family has over the company is disproportionately large. Moreover, with regards to control I would like to talk about the concept of dictatorships within family businesses. There are numerous cases where the founder has a lot of power within the company and maintains that position of power until he reaches an advanced age. This phenomenon can be seen all over Asia, including Japan. While a company controlled in this way has an edge in speed of decision-making, in such a company the issues of succession and inheritance is never concretely discussed. In which case, such issues will only suddenly surface when the founder no longer has the physical strength to remain active in his role. The result of which is that the experiences, knowledge and connections that the founder has would not be passed on to the next generation. I see the relationship between family businesses and regular shareholders as a discussion of financing and accountability . Rather, the issue with the governance of family businesses is the debate on how to keep the company going after controlling the runaway dictatorship. Here I would like to discuss the role of the board of directors, and an example from Europe would be helpful in this case. In a family business from Germany, out of the five members of the board of directors 3 people – including the chairman – are from outside the founding family, and only 2 are from the family. In this case, the role of the board members, rather than to oversee the company for the shareholders their role is revolved around making the right decisions for the company as a family business. Therefore, the outsider chairman is one who has previous experiences in managing other family businesses, and as such a deep understanding of family businesses is what is emphasized in the process of personnel selection. Their stance is not in using a high salary to buy the knowledge and experience. In addition, for this company there is a rule that the majority of the board members would be chosen from those outside the family, as determined by the family charter. So the board of directors is there to function as a place to take on the role as an asset for the family, while at the same time taking on the responsibilities to the public as a company. I feel that, for family businesses “continuity” becomes a key word; given the discussion up to this point, I have the impression that Thai family businesses do not appear to have developed a mechanism to ensure such a “continuity / sustainability”. For Thai family businesses, the desire to build up their assets is much stronger than the desire to maintain the business. Back to the example of the family business I am consulting for, when I asked the president what his strategy for the future of the company was, his reply was that he has not really considered it. It seems that, as he has rapidly expanded the company to build assets for the family, he has not had the time to think about the strategy for the future of the company. Alternatively, he puts so much priority on familial circumstances that the circumstances around general company management are postponed. As the number of family businesses in Thailand that are going public is likely to increase, in the future companies should be more aware of the issues of “continuity / sustainability”. You have said that family businesses in Thailand have to change, but on the other hand, there are advantageous properties unique family businesses. In Japan, there are numerous family businesses with a very long history. How should one think about the source of their competitiveness? Such factors are, I believe, things that should be maintained even as Thai family businesses evolve. For example, a regional network is a great asset for a family business. The relationship with influential people within a region can be a source of competitive advantage. Since in the world of politics many politicians are part of a political dynasty, with children becoming politicians after their parents they can become a powerful asset for a family business. Additionally, the stakeholders’ trust on the family can be a valuable asset. While taking advantage of assets such as these networks and trust, the ability to make decisions quickly by those at the top is a strength for family businesses. Of course, the issue of dictatorship is also inextricably linked to such strengths. When looking at the issues of family businesses in Thailand from a Japanese company’s perspective, it seems that such compliance issues cannot be ignored if Thai companies are to be a target of investment or partnerships. That is exactly right. The management of family businesses up to this point only had their eyes on managing their own assets while disregarding other issues. As a result, the lending and borrowing of cash between businesses within the same company group can be a daily occurrence, and financial statements may not be appropriately made. To accept foreign investments, or to partner up with foreign companies it is essential to increase the transparency of the management. Thank you very much. We now have a greater understanding of the strengths and weaknesses of Thai family businesses. CDI certainly takes on unique activities. It was very interesting to hear about your consulting for companies in Southeast Asia. Thank you for the interview. After obtaining a bachelor’s and master’s degree in Economics from Thammasat University (Thailand), she went on to obtain a master’s degree and doctorate in Economics at Hitotsubashi University. There she worked as the visiting professor, later as the associate professor, then as professor. 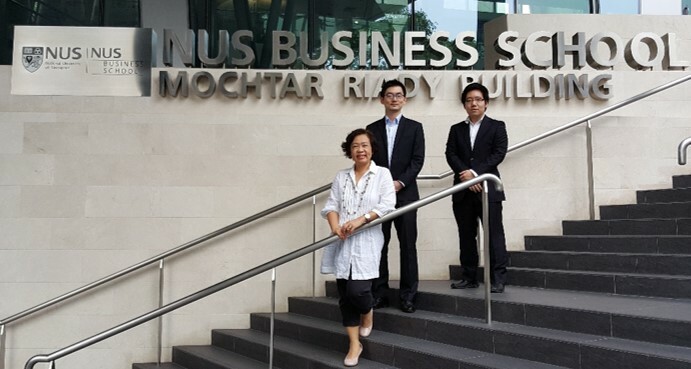 She holds her current position at NUS business school since June 2010. She specializes in corporate finance and corporate governance, with recent research focusing on publicly traded family-owned companies from all over the world, on their strengths and weaknesses, business succession and governance.